... and for birds, bears and fish as beetles and blister rust threaten the trees and entire ecosystems. 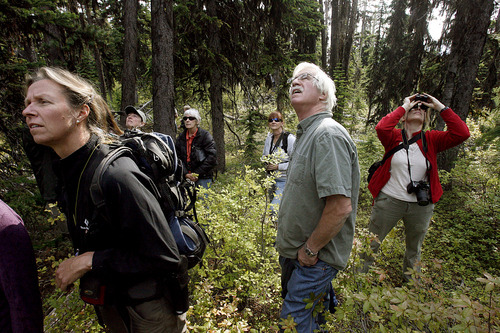 Rick Egan | The Salt Lake Tribune Participants in the Whitebark Pine Symposium explore a forest near Kimberley, Alberta Canada, Saturday, September 15, 2012. 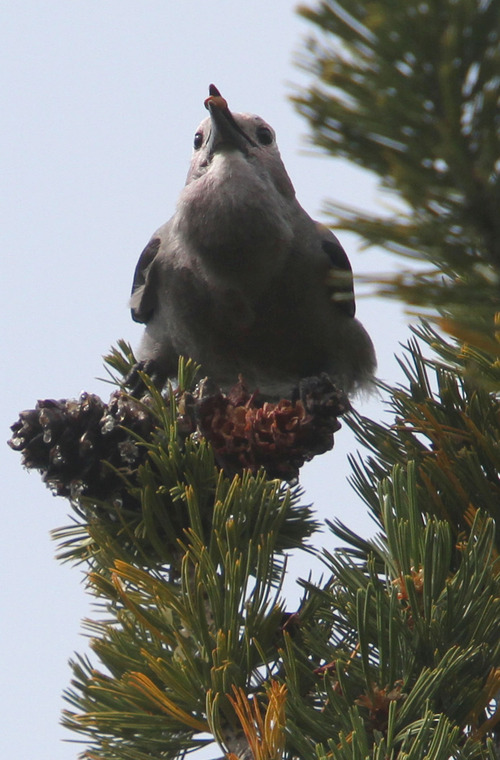 Rick Egan | The Salt Lake Tribune The Clark's nutcracker feeds on the pinecones on top of a whitebark pine tree in a forest near Kimberley, Alberta, Canada, Saturday, September 15, 2012. 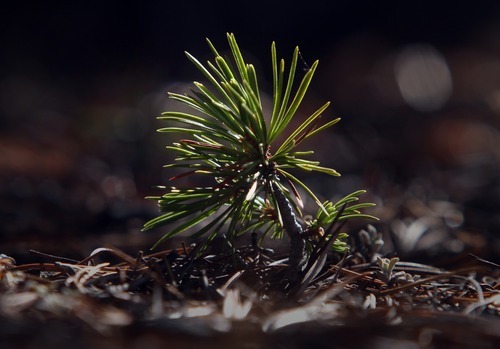 Rick Egan | The Salt Lake Tribune A whitebark pine seedling grows in the Wind River Mountains of Wyoming, Monday, October 1, 2012. Rick Egan | The Salt Lake Tribune A Clark's nutcracker with a full gullet hoards the seeds atop a whitebark pine tree near Kimberley, British Columbia, Canada, Saturday, September 15, 2012. These birds bury seeds and sometimes forget them, reseeding the forest. Rick Egan | The Salt Lake Tribune Jesse Logan shows the seeds from a Whitebark Pine cone, in the Blue Ridge Mountains of Wyoming, Monday, October 1, 2012. 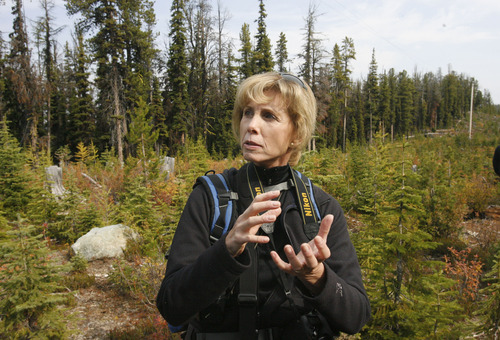 Rick Egan | The Salt Lake Tribune University of Colorado Denver ecologist Diana Tomback says whitebark pine restoration will require millions in government funds, near Kimberley, British Columbia, Canada, Saturday, September 15, 2012. Rick Egan | The Salt Lake Tribune Participants from a whitebark pine symposium explore a forest near Kimberley, British Columbia, Canada, Saturday, September 15, 2012. Mount Puddingburn, British Columbia • Gray birds with black-and-white wings slash through the forest canopy, squawking and shoving one another from treetop pine cones. It&apos;s a good cone crop this year in southwestern Canada, and the Clark&apos;s nutcrackers are staging the kind of full-throated show that is rapidly fading from most of the West&apos;s high country. They&apos;re heckling and buzzing, their gullets bulging like those of fish-hoarding pelicans. They&apos;re hauling pine seeds that they&apos;ll bury here and there for later. Cunning as they are, these cousins to crows and ravens will forget where they put some, and the whitebark pine&apos;s plan for seed dispersal will be complete. But even amid nature&apos;s noise, the endangered whitebark may be history  and soon. Its free fall threatens a chain of creatures from birds to bears to trout. 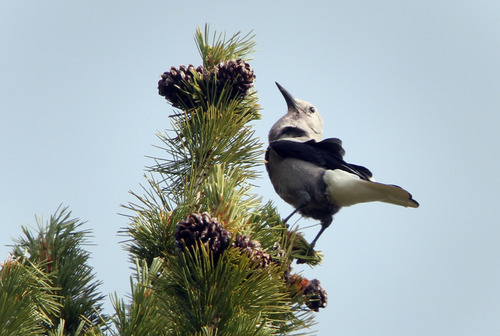 "I feel sorry for the birds," said Diana Tomback, a University of Colorado Denver ecologist and director of the Whitebark Pine Ecosystem Foundation. "The [disease] prevalence is unbelievable." Twin menaces  a blister rust brought from Eurasia with imported plants and a native bark beetle with an assist from climate change  have made chalky graveyards of the twisted pines. Dead slopes tell the story along a string of Rocky Mountain national parks  from Alberta&apos;s Jasper to Wyoming&apos;s Grand Teton. Beetles have stripped the mountains in the whitebark&apos;s southern range. In Wyoming&apos;s Yellowstone ecosystem, an interagency team tagged 5,000 live trees in 2004-2007 only to return in 2008-2010 and find two-thirds of the large cone-bearing trees had perished. Here on Mount Puddingburn, blister rust&apos;s yellow pustules bubble from the bark everywhere, threatening to choke off life by girdling nutrient flows. For now, the nutcrackers are earning their name, repeatedly cocking their heads and then hammering the hard cones under their feet. The cones are locked with a purplish resin, and eventually the birds must scrape both sides of their bills clean against the limbs  as if sharpening a knife. Tomback is here with dozens of U.S. and Canadian scientists along with whitebark enthusiasts for a late-summer field trip. The site, on a peak housing a nearby airport&apos;s beacon, offers a view of what&apos;s at stake. These trees anchor the soil and, during winter, the snow that otherwise would wash rapidly into surrounding lowlands and their Columbia River tributaries next spring. They shade a spongy understory, creating little habitats in harsh areas where other trees couldn&apos;t take root on their own. The pines feed the squirrels, the birds, the bears, and they regulate the rivers with snowmelt to keep them  and trout and salmon  comfortably cool through summer. Puddingburn also provides a clear picture of the danger. A Canadian researcher finds 74 percent of the trees he is studying are suffering blister rust. That&apos;s up 5 percent since his last check in 2004. Blister rust is the prime killer here and in the whitebark&apos;s wetter ranges, including Glacier National Park. There&apos;s been no stopping it, though the U.S. and Canada are seeking disease-resistant trees from which to replant a future forest. In drier zones, such as those in and around Yellowstone, mountain pine beetles are doing most of the damage. There, in locations around 10,000 feet where average temperatures have risen a few degrees since the 1970s, U.S. Forest Service researchers find the insects thriving and multiplying faster than they could have when minus-40 deep freezes were routine. 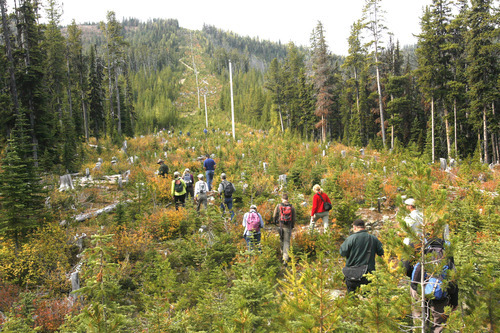 Canada listed the whitebark this year for protection under its Species at Risk Act. The U.S. Fish and Wildlife Service last year decreed the tree threatened enough to justify inclusion among the nation&apos;s endangered species, but did not list it because of funding needs for higher-priority species. The agency reconsiders its priorities each year and is counting on researchers to collect more data about the tree. Climate change was a major factor. "In the past, the beetles hadn&apos;t been going up into those high-elevation areas, and that was temperature-related," said Amy Nicholas, Fish and Wildlife Service biologist coordinating the effort from Wyoming. "That&apos;s pretty clear because you&apos;re looking at trees that are 500 or 600 years old, so you know they haven&apos;t been affected by any previous outbreaks." But what can endangered status buy a species threatened primarily by natural invaders and climbing temperatures? Whitebarks grow in rocky, inaccessible country and are more brittle and gnarly than other pines, so U.S. loggers have generally ignored them. Tomback hopes a listing will lead to restoration dollars  money to collect seeds from resistant trees and replant these forests. The Forest Service&apos;s current program, she said, provides $250,000 pegged by Montana&apos;s congressional delegation. "We need millions of dollars," Tomback said, "not hundreds of thousands." In Canada, whitebarks inhabiting mixed forests sometimes are cut and passed off as other pine lumber, said Randy Moody, a forestry consultant who heads the foundation&apos;s chapter north of the border. That could give the tree&apos;s Canadian listing more urgency, but federal law is more limited there. Unlike in the United States, provinces control almost all public forests. But they tend to cooperate with Ottawa on species preservation. Moody said the listing has raised awareness that will save trees. The Canadian listing also helps make a case for more funding, whether for research or preventive steps such as stapling anti-beetle pheromones on trees each summer. When it comes to money, though, Canada&apos;s effort is even less than America&apos;s  in the tens of thousands. "There are a lot of grass-roots people," Moody said, "just doing what they can do on their own." Some scientists fear the whitebark is poorly equipped to fight beetles because it didn&apos;t evolve with them. "The short answer is we don&apos;t really know what the defensive capabilities of whitebark pine are like," said Ken Raffa, an entomologist at the University of Wisconsin. Raffa and his graduate students are working in the Yellowstone area to learn whether the gooey pitch that whitebarks ooze to encase and repel pine beetles is less toxic than, say, that of lodgepole or Ponderosa pines. "Unfortunately," Raffa said, "[researchers] never paid much attention to whitebark pine because it&apos;s not an economically important species." But it is vitally important to Yellowstone&apos;s grizzlies. 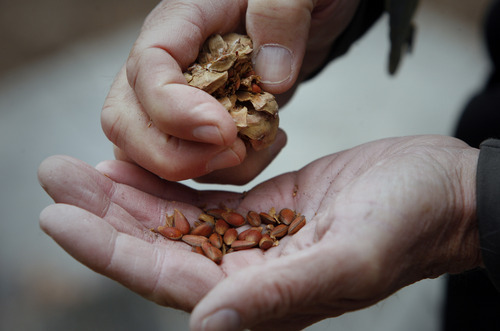 Whitebark seeds, though smaller, taste like commercial pine nuts and are up to 50 percent fat. They aren&apos;t perishable, meaning they&apos;ll persist in cone middens buried by squirrels until bears sniff them out and gorge before hibernation and birthing. They provide the best possible calories for a mama bear about to spend four months nursing two or three cubs before her next meal. "Where the whitebark seeds are available," U.S. Geological Survey biologist Kate Kendall said, "bears prefer them to almost any other food." Where Kendall works, around Glacier National Park, the trees and their seeds are gone but huckleberries and other foods from the lush landscape have sustained bears. Yellowstone is less fruitful, and the worry is that hungry grizzlies will wander downhill seeking elk meat in fall. That would increase human encounters that lead to bears being shot every year. "My guess is bears will still survive in Yellowstone if whitebark pines are wiped out," Kendall said, "but it has to have an effect on carrying capacity." The U.S. Fish and Wildlife Service estimates Yellowstone and the national forests branching from it harbor about 600 grizzlies. That&apos;s twice the population that existed when the government listed the bears as endangered in 1975, and observations suggest they&apos;ve filled out previously unoccupied habitat, such as the Wind River Range. A federal judge ruled last fall that the feds could not remove Yellowstone grizzlies from the endangered list without better evidence that the whitebark collapse won&apos;t ripple through the population. Frank van Manen, leader of the Interagency Grizzly Bear Study Team, said scientists are comparing data in a grizzly-whitebark "synthesis" report due next year. "We know [whitebark] is very important for grizzly bears, but what is the plasticity of the population in terms of switching?" he said. "This is pretty much what we&apos;re completely focused on." Beetles also are attacking the limber pine, a related species serving similar functions south of whitebark and grizzly range on the ridges above ski slopes in Utah and Colorado. Across the highest reaches of the Rockies, Tomback said, human activities are affecting the most sensitive forests  and everything below them. Railroad builders, miners and settlers cut large swaths of lower lodgepole pines in the 19th century, she said, and left those trees to grow old and attract beetles in the late 20th century. Fire suppression piled on, removing a natural regenerator of young, beetle-resistant trees of varied age classes. Climate change then opened new turf for the beetle eruption. "If you were to sit down and say, &apos;How could we engineer this so we can extirpate this tree?&apos; " Tomback said, "you couldn&apos;t do a better job."